For my birthday this past weekend, I was lucky enough to get a bunch of awesome new books! I have heard so many great things about these books and I am really excited to read them! The Court of Thorns and Roses Coloring Book: This is a gorgeous companion book to the ACOTAR series by Sarah J Maas. It features coloring pages depicting select scenes from all three novels. I can’t wait to bust out my colored pencils! Strange the Dreamer: This is the first book in a new duology by Laini Taylor and it sounds epic! It is about a war between men and the gods, a lost city, heroes, warriors, a goddess and a young librarian who happens to get wrapped up in it all. A Torch Against the Night: This is the sequel to Sabaa Tahir’s debut novel An Ember in the Ashes. I read the first one right after it came out and really liked it, but have not had the chance to pick up this second one yet. I am definitely looking forward to seeing what has happened to Elias, Laia, and Helene! 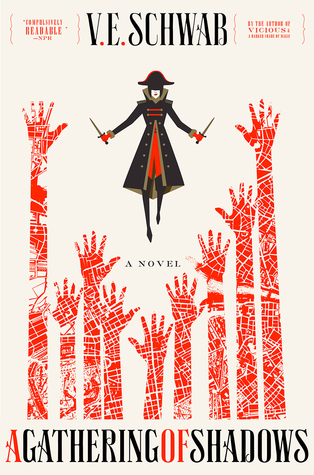 A Darker Shade of Magic: From V. E. Schwab, this is the story of Kell, one of the last, rare magicians of his kind. He can travel between the different Londons: Grey, Red, and White, but that does not mean he can always avoid trouble. This one has been on my TBR list for ages and I am so happy I finally have it in my hands! The Crown’s Game: The last two Enchanters in Russia, Vika and Nikolai, must battle to the death, so that the victor can stand at the side of the Tsar in the coming war. Count me in! The Star-Touched Queen: I have heard so many good things about this book, such as beautiful prose and imaginative story-telling. The protagonist, Maya, cursed with a bad fortune in her own kingdom is married off to another. There, she becomes a queen and a wife, she finds power and love. But, she also stumbles upon secrets and mysteries that could threaten her life and the lives of those she loves. Man, I am going to be busy for a while! Now, I just need to figure out which book I am going to start with.